The Globe Theatre Lords Rooms were considered the best seats in the 'house'. They were certainly the most expensive seats but why were they considered the best? The Lords Rooms were situated in the balconies, or galleries, at the back of the stage above the Tiring Rooms. The seats cost 5d - five times more than the pit. The Lords Rooms provided a poor view of the play and the back of the actors. But these seats were the closest to the actors and therefore these wealthy theatre goers were able to hear every word of the play and the sound quality in the Globe Theatre was poor. These upper class Elizabethans believed that they were better able to appreciate the finer points of dialogue - in fact plays produced in the enclosed and more expensive playhouses were deliberately text-heavy to suit the more intimate atmosphere and more exclusive clientele. The word 'audience' is derived from the Latin word audientia and the old French word 'audre' meaning to hear. The other good reason for these exclusive seats were because the audience would have a good view of the Lords. These Elizabethan nobles were able to show-off their fine clothes to the lower classes. The type of clothes worn during the Elizabethan era were strictly dictated by the Sumptuary Laws. People who lived during Elizabethan times were not allowed to wear whatever they liked! It did not matter how wealthy they were - the fabric, and even the style of their clothes were dictated by rank, status or position and these strict rules were enforced by English Law. Due to the Statutes of Apparel (The Sumptuary Laws ) ordinary Elizabethans were not able to wear the latest fashions. Fashionable clothes would only be seen at a distance, when wealthy nobles or Royalty were in view! The Lords had no interest in the Lower Classes - and the Lords Rooms enabled them to keep a good distance from the 'rabble' in the pit. 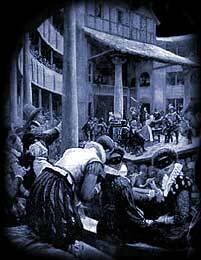 The Globe audience who paid the least entrance money stood in the pit and were often referred to as 'Groundlings'. However, due to the hot summer days they were also referred to as 'Stinkards' for obvious reasons. The nobles would also wish to keep their distance from the lower classes because of the terrible and constant threat of the frequent outbreaks of the Bubonic Plague. Interesting Facts and information about the Globe Theatre Lords Rooms. 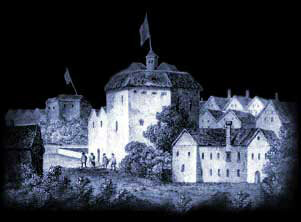 Additional details, facts and information about the Globe Theatre can be accessed via the Globe Theatre Sitemap.